When the intact grave of a Bronze Age man was discovered in Pylos, southwestern Greece, two years ago, it was so dense with luxurious grave goods that it set a new record for the wealthiest single grave ever found in Greece. Its location, next to the so-called Palace of Nestor of Trojan War fame, and the richness of the contents even generated breathless speculation that this might be the tomb of a Homeric hero. Entirely groundless speculation — the shaft tomb is around 300 years older than the palace which was destroyed in 1,180 B.C. — but it’s an inescapable side-effect when archaeologists discover ivory-handled, gold-covered weapons, four gold signet rings, more than 1,000 semi-precious stone beads, silver and bronze cups, a massive gold chain, 50 seal stones decorated with Minoan motifs, carved ivory and ever so much more, enough to reignite a million childhood fantasies of pirate booty treasure maps where X always marks the spot. 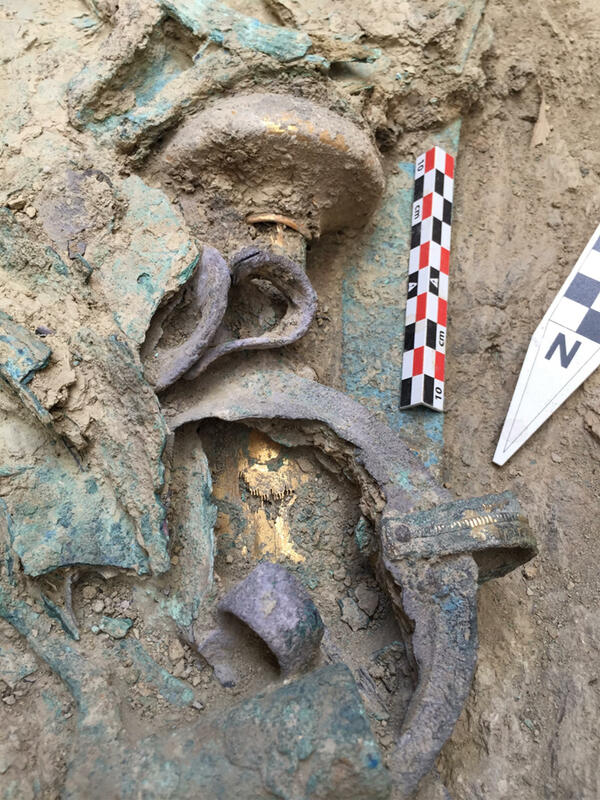 After the dust from the dig had settled, the team, led by University of Cincinnati archaeologists Jack Davis and Sharon Stocker, had unearthed more than 3,000 burial objects, all of which were sent to the Archaeological Museum of Chora for triage, study and conservation. One of the objects was a small sort of kite-shaped piece caked in thick lime accretions entirely obscuring its surface. It was put in the To Do pile while conservators focused on the larger ticket items, like the heaps of gold, weapons and jewels. 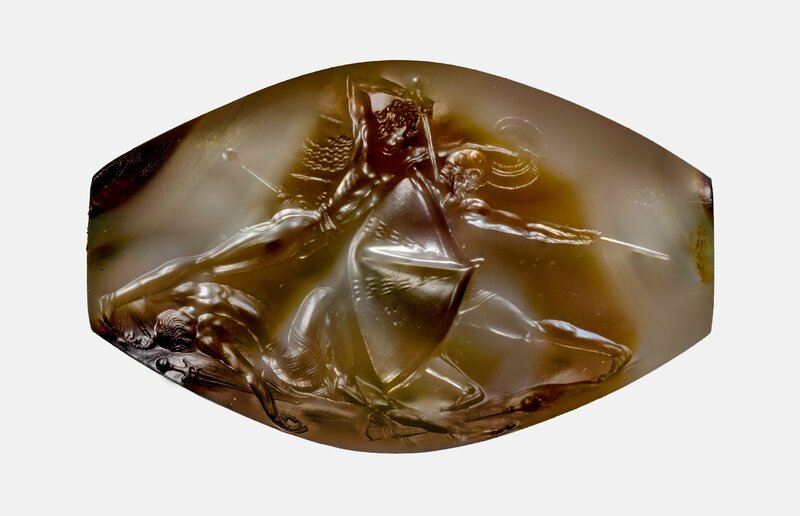 They were finally able to beging cleaning the wee thing — it’s less than an inch and a half long — a year later and discovered that under all lime scale was one of the greatest pieces of art in Greek history. It’s a sealstone, not made of precious metals like the signet rings found in the tomb, but of agate. This one’s value is in the astonishing detail and precision in the miniature carving. 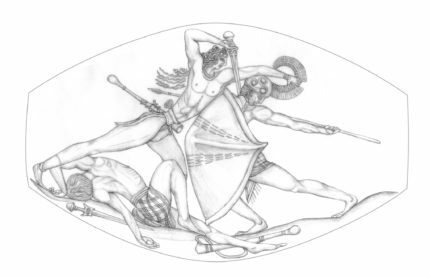 Davis and Stocker say the Pylos Combat Agate’s craftsmanship and exquisite detail make it the finest discovered work of glyptic art produced in the Aegean Bronze Age. The miniature masterpiece portrays a victorious warrior who, having already vanquished one unfortunate opponent sprawled at his feet, now turns his attention to another much more formidable foe, plunging his sword into the shielded man’s exposed neck in what is sure to be a final and fatal blow. This thing is unbelievable. I think I’ve stared at the fallen fighter on the left for a solid hour. Beyond all the superlatives that can and should be showered upon this marvel of artistry, researchers believe the sealstone reveals new information of major significance about Minoan culture and their interactions with the Mycenaeans who so thirstily drank of Minoan culture and spread it throughout the Greek mainland. “This seal should be included in all forthcoming art history texts, and will change the way that prehistoric art is viewed,” said Stocker. For more about the Griffin Warrior tomb, check out this thoroughly documented, content-rich website created by Davis and Stocker and the Pylos team. Pictures are a bit small, alas, but they need to pinch bandwidth pennies because conserving an enormous quantity of priceless archaeological artifacts is an expensive proposition, especially trying to keep the fragmentary bronze armour from falling apart. You can contribute to the project here. All donations go directly to conservation. This entry was posted on Tuesday, November 7th, 2017 at 11:45 PM	and is filed under Ancient, Treasures. You can follow any responses to this entry through the RSS 2.0 feed. You can skip to the end and leave a response. Pinging is currently not allowed. There is almost a 3d-effect to this marvelous masterpiece. The (rather crude) Mohs scale hardness of this stuff is ‘7’. That of diamond would be ’10’, and with ‘7’ you could carve into window glass. Thus, there is seemingly not an awful lot that Achate could be carved with, it seems. There is a time frame of 1500 years. To me, Minoan interactions with Mycenaeans are no real surprise. I’ve been to Mycenae and to the Minoan ‘palace’ of Phaistos and its Minoan surroundings. Egypt kept records about (Egyptian) interactions with (lots of) ‘Sea Peoples’. There were even interactions, although possibly no direct ones, with people at the Baltic Sea and Greece, and amber was traded through to Egypt and the Levant (e.g. Syria). Of course, there were trading posts in between. A ‘Mycenaean’ amber seal was found in Bavaria, recently. 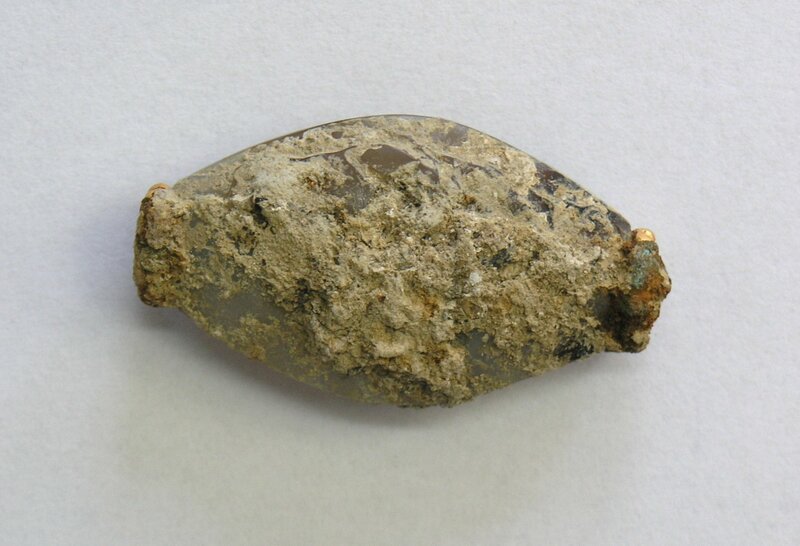 On the picture of the sealstone before cleaning it appears to have gold fittings at each end. Is this just my eyes? Good eye ! – There might be something holding the agate, and it might be indeed what you saw in the picture before cleaning, and on the right side the greenish residue might be copper. There might even be some wear on the piece itself. The helmet of the one that receives the deadly blow and particularly its adornment does ring a bell, but unfortunately I could not say which one. That ‘adornment’ could be a small shield that the aggressor is holding, but it looks indeed more like adornment that he is clinging to in order to slash him down. Also, he seems to wear a club-scabbard (for ‘battering’). Fun fact: The lions in Europe (panthera leo spelaea) were considerably larger than the current ones in Africa, but they were extinct. On the Balkan Peninsula, of which Greece is a part, there were residual lions until only 2 millennia ago, but there is no real proof that they were ‘spelaea’. However, in Mycenae, or nearby, they obviously contributed to that extinction (look at those lions!). I believe I see the same silhouette with gold fittings at each end. Just like the Baghdad batteries used for plating jewelry with gold through electrolysis, we have another technological conundrum. My favorite detail is the amazingly realistic folds in the clothes of the guy on the right. I can’t figure out the arm of the warrior on the right. It seems to be a well carved right arm, but the shoulder couldn’t have been seen from the viewer’s position. Maybe the full arm was too important to hide. Wow. amazing. How on earth was the maker able to do such fine work? Did they have any type of magnifying glass at that time? I think I also see that the one piercing the neck has fallen on the spear of his victim. I think one of the realistic aspects is that the figure on the left has grasped the helmet crest of the right hand figure and twisted his head around to expose his neck. This indicates that the carver was familiar with hand to hand combat or was instructed by someone who was. As for what tool material the stone carver used I would guess corundum which is 9 on the Mohs scale of hardness. There are deposits of corundum on the Greek island of Naxos. It could also have been imported from India. Yessir … Emily, you seem to live in a rather quiet neighborhood. The ‘slasher’ managed to bypass the ‘danger zone’, his victim reaches back, but unfortunately the ‘pilum’ is now too long, and the way he is holding it, the swordsman is out of reach, which himself now flexes his opponents head, frees the victims shoulder and fatally thrusts that blade into his neck (Yes, unfortunately, I live downtown). Mycenaean has a two letter word for copper ‘Ka-Ko’ (cf. ‘χαλκός’), but the (less) Ancient Greek comes up with quite a variety of ‘spears’: ἔγχος n spear, lance, δόρυ n shaft, stem, αἰχμή f spear, ἀρίγων m spear, ἐγχείη f spear, lance, κοντάριον n spear, λόγχη f spear-head, σιβύνη f hunting spear, σιγύνης m spear, χαλκός m copper … My own wasp waste is not that tiny, but apart from that, I’d say the thing is realistic. It’s crude, but it will do the job if you have good eyesight and plenty of time to carve the item. An item like that would likely be an occasional one off by a craftsman for a small handful of the elite of that society, something done a few times in your life. Time wouldn’t be a problem, shot eyes during the process, an unsteady hand, or an unseen flaw in the agate would be disastrous. The postures and proportions of the figures are similar to those in the bronze dagger with the lion hunting scene found at Mycenae. Similar wrap-around shields are depicted in that artifact as well. Compare the victim’s helmet with the one from the Wikipedia article on the ‘Agris Helmet‘ (from Agris in France), where there is also a picture of a very similar ‘Amfreville helmet‘ (Amfreville-sous-les-Monts). Like these, our considerably older victim’s helmet features a ‘triskalon’, which itself is roughly a thousand years older -used in Mycenae likewise as elsewhere in Europe, i.e. it won’t mean a lot- while both the French helmets feature elements that I personally would consider to be ‘partially Greek’. Rather confusing, space, time, the ‘interactions’ and all that ! Amazing,all three subjects are dead or dying. The soldier on the right (shield) has had his head forced away to his rear by the left hand of the swordsman by grabbing the plume on the helmet to expose his neck to the sword of the soldier on the left. However, the spear appears to have been stabbed through the soldier on the left. Mortal wounds both, the man on the ground is unlikely to rise again. Moral; war has no victors. The muscle anatomy is stunning. The composition is also excellent. Colossal find. It’s a draw, all three are dead or dying. The man on the right has had his head turned rearward by the swordsman, but in the carving the spear appears to have been stabbed through the chest of the swordsman. There is still great muscle tension in the right arm holding the spear. The drawing show’s the spear as a miss without an exit wound, however in the carving it’s dark just like the rear of JFK’s head in the altered Z-film. Moral; All are dead, war has no victors. Sadly, our world is becoming more and more like the world portrayed on the stone. The internet has brought this reality into my quiet neighborhood. Something that I just noticed is that the “kilts” of the fallen figure and the right hand figure appear to be woven in a “tartan” weave. Some of the oldest surviving textiles are woven in this double striped pattern. Highland tartan kilts in bronze age Greece?! BTW, I do not agree with the interpretation that the figure on the left has been impaled on the spear of the right hand figure. The left figure’s torso has been rotated towards the viewer and it appears that the spear has missed him. Rotating the upper body while attacking a spearman may have been an intentional tactic to present a smaller target. I am afraid that the interpretation that the message of the piece is that everyone loses in a conflict is imposing 21st century values and interpretations on bronze age Greece. That was an age which idealized the hero and here is an illustration of a hero dispatching two enemies in a heroic manner. Nice catch on the the guy with the sword, George and excellent observation on society at the time. Anyone who has had to go through pugil stick drill learns quickly, painfully, and embarrassingly not to over-commit on the thrust. The fellow with the lance on the seal did, leaving himself wide open to be turned and stuck. The guy with the short sword with his side-step/helmet grab has put the lancers shield between him and the lance rendering the weapon and shield useless to the man, about to have his arteries, heart, and lungs pierced from above. There was a winner that day, and it was the fellow with the sword. That action all would have taken place in maybe two seconds, tops, not a static event like the seal. This isn’t play being depicted. Kill him, discard him, and move on to the next one coming. It also makes me wonder it wasn’t a famous episode from early in the man in the tomb’s life? I have little doubt this is an Homeric depiction drawn from the Iliad, with an Achaean on the left and a Trojan on the right. The naked warrior could even be Achilleus. America as a western civilization can trace its foundation directly back 3000 years, in one way or another, to the warrior in this grave in Pylos. Even the art on this signet is familiar to our consciousness today after three millennia of exposure. And the irony is that 3,000 years later, this unfortunate man’s grave was disturbed by, of all people, some card carrying AARP members Americans, who are quite frankly the exact opposites of the warrior buried here.